Since 1977, Monona Plumbing & Fire Protection has been a trusted contractor for businesses and homeowners alike. From humble beginnings as “Monona Plumbing, Inc.”, we have transformed over the years and offer plumbing, fire protection, site utility, earthwork, and 24/7 commercial and residential services. We serve a variety of markets through commercial construction and 24/7 commercial and residential service. Since our founding in 1977, we have built a solid reputation as a high quality, customer and safety oriented contractor. With over 150 professional and skilled trades employees, leading edge technologies, and our own large fleet of over 130 units of light and heavy duty construction equipment, trucks, and service vehicles, Monona Plumbing & Fire Protection has grown to become a leader in the industry and one of the largest subcontractors in the Madison area. Quality craftsmanship, customer service, and safety are at the core of who we are. These fundamental values will never be compromised. Our proprietary system, “The Monona Way” was originally designed to build consistency and set expectations. Today it has evolved as the guiding principle for how we do business. It is our pathway to delivering an exceptional experience and provides the foundation for the quality and craftsmanship of our work. The Monona Way is about consistently delivering exceptional experiences to our customers, continually exceeding their expectations, and building lasting relationships along the way. We are committed to the future of our company, our customers, and our people. We are a family oriented company with a culture of collaboration and teamwork. We promote a work environment in which lasting relationships are built and hard work and fun go hand in hand. When we are not working, we get together for company events such as bowling outings, golf outings, badger tailgates, holiday parties, lunches, and cookouts. We are committed to consistently delivering exceptional experiences to our customers and team members. Our goal is to stand out from the competition by providing our customers and team members with the very best. We do this through our people. We believe the right people make all of the difference. Each and every employee provides a unique role in enhancing our services and exceeding our customers’ expectations. Monona looks for employees who live their life, love their work, are personally accountable and go beyond what is required. We strive to create opportunity for our employees who are committed to the essentials of quality, customer service, safety and who demonstrate our core values. Everything we do, and the way in which we do it, is aligned with our core values. Quality craftsmanship, customer service, and safety are at the core of who we are. We will not allow these fundamentals to be compromised. Beyond our focus on the essentials of quality and customer service, and our commitment to safety, we have a set of core values. 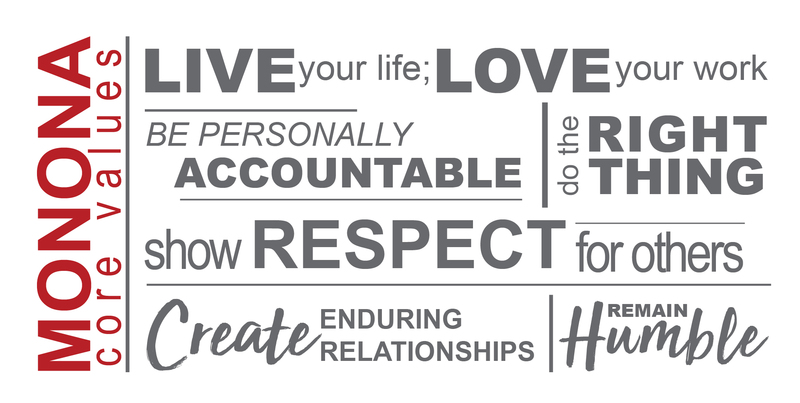 We believe it is these values that set us apart. Our core values shape our corporate culture and define our collective character. Our success comes from consistently delivering quality products and services to our customers and living these values day-in and day-out. Our staff includes highly trained and qualified professional and skilled trades people, including licensed plumbers and sprinkler fitters, heavy equipment operators and pipelayers, service technicians, sprinkler inspectors, apprentices and pre-apprentices; estimators, project managers, and designers; and corporate support and shop functions including shop/warehouse laborers and fabricators, and corporate services and administrative staff. Check out our current job openings to see if Monona Plumbing & Fire Protection has a career opportunity that is right for you! If you are interested in a position that is not currently listed, please email your resume to jobs@mononapfp.com for consideration.